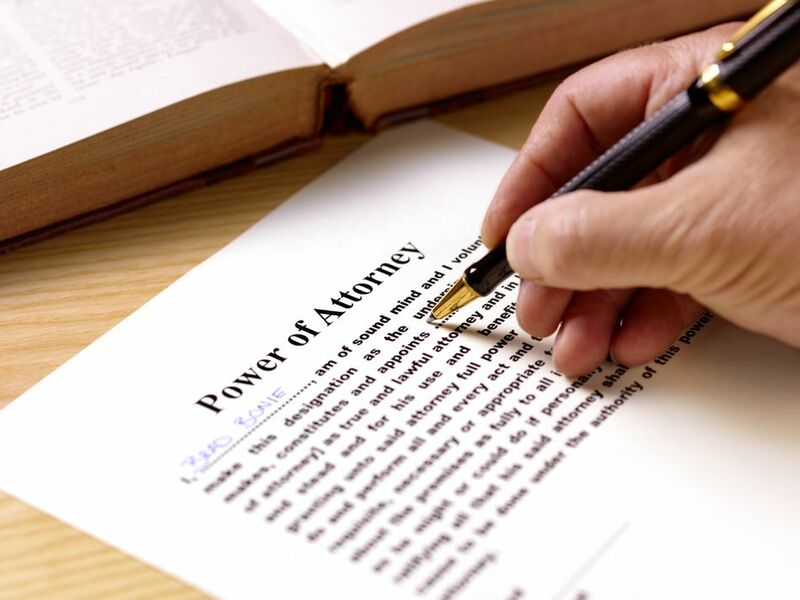 A power of attorney names someone to handle your finances for you. This is the most important thing for every person to have. If you are hurt or disabled, temporarily or permanently, you need to make sure that you have designated an agent to take care of your financial affairs. You don't have to be old to need this. Young people get hurt in accidents and have periods of unavailability or incapacity just as well as older folks. Most people will have a period of time sometime in their lives where they can't take care of things by themselves - whether they are young or old. This is the gap that a power of attorney fills. Your spouse does not have the authority to act for you. Just being married does not give your spouse control over your finances. Things that might need to be done for you if you are hurt or incapacitated are paying bills, making Insurance claims, managing investments, filing tax returns. Make sure that you name a back-up agent in case the first named person cannot or will not serve. If you can't take care of your finances yourself and you haven't designated someone as an agent under a power of attorney, the only alternative is a court-appointed guardian. That's a very expensive, inconvenient and burdensome alternative. In the power of attorney you can also designate who should be your guardian if it becomes necessary for you to have a court-appointed guardian. If you are unconscious and a decision needs to be made about medical treatment, who decides? Or if you are cognitively impaired, who makes treatment decisions? Similarly to a financial power of attorney and medical or health care power of attorney appoints an agent to make medical decisions for you when you can't do so yourself. Make sure you name a back-up agent in case the first named person cannot or will not serve. The document should also contain physical address, e-mail, and phone numbers for agents so that health care providers can find them. This is an odd name for a document that states your wishes about end of life care. If you are terminably ill ad cannot state your own wishes, what kind of treatment so you want. Should you be maintain on a ventilator, dialysis or other types of treatment. A living will is an important document for your family as well as for medical service providers - it states clearly what your wishes are and helps to remove doubt and guilt. Everyone should have a will. Making a will allows you to designate who receives your property, appoint an executor (who will be in charge of settling your estate), and appoint a guardian for minor children. If you die without a will, your state intestacy statute will spell out who gets your property. It does not automatically go to the state. The usual distribution is a portion for a surviving spouse with the balance to children or parents. If there is no surviving spouse, then to children, then parents, siblings, nieces and nephews. Retirement plans, IRAs, life insurance, annuities - they all give the owner an opportunity to designate a beneficiary. If a beneficiary is designated, these assets are paid directly to the beneficiary. They do not pass according to the will. Many folks have most of their net worth in these kind of assets, especially retirement plans like 4019(k)s and IRAs. Unfortunately, the designation forms usually give you a tiny space to write your wishes. Don't be prisoner of the form! Write "see attached" and on a separate sheet of paper write out the exact disposition you want for your benefits. Make sure you include contingent beneficiaries in case the beneficiaries you name do not survive you. As with any legal document, you should always consult with an attorney. Make sure the attorney you consult is knowledgeable about and experienced in estate planning. Think about these 5 items ahead of time to make your meeting with your attorney more productive.